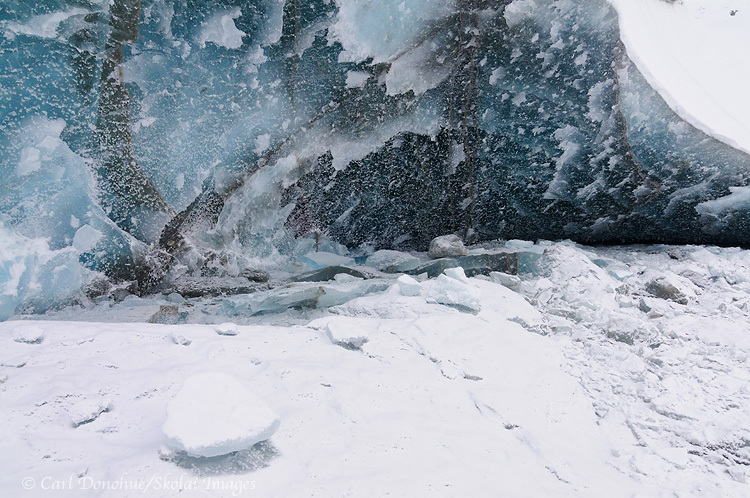 Kuskulana Glacier photo, ice cave, Wrangell - St. Elias National Park and Preserve, Alaska. An ice cave on the Kuskulana Glacier, in the Wrangell Mountains. Winter snow and freezing temperatures ice up the water of the Kuskulana River, and the this wall of ice is a myriad of patterns, colors, and textures. Kuskulana Glacier, Wrangell - St. Elias National Park and Preserve, Alaska. Please click on the image above to view a larger version of this photo. “Almost always, the creative dedicated minority has made the world better.” ≈ Martin Luther King, Jr. This entry was posted in Abstract Photos, Adventures, Alaska, Landscapes, Miscellaneous, News, People, Skiing, Winter, Wrangell - St. Elias National Park and tagged Glaciers, Landscapes, scenics, Winter, Wrangell - St. Elias National Park on January 17, 2011 by Carl D.
Great image and it must have been an incredible experience to see it in person! Thanks so much – I really appreciate the kind words. And yes, seeing this cool feature on the glacier was a real treat. Made a somewhat frustrating and arduous trip really rewarding. The ice cave is fabulous! The image is so realistic!